Carefully wash the potatoes and cut them first in half then in 4 and finally in 8 long stalks. Put the potatoes in cold water for at least 1 hour. Heat the oil in a non-stick frying pan, and then drain and dry thoroughly the potato chips. As soon as the oil is hot fry the potatoes. You can also add herbs or spices to the oil, such as a clove of garlic and rosemary leaves. 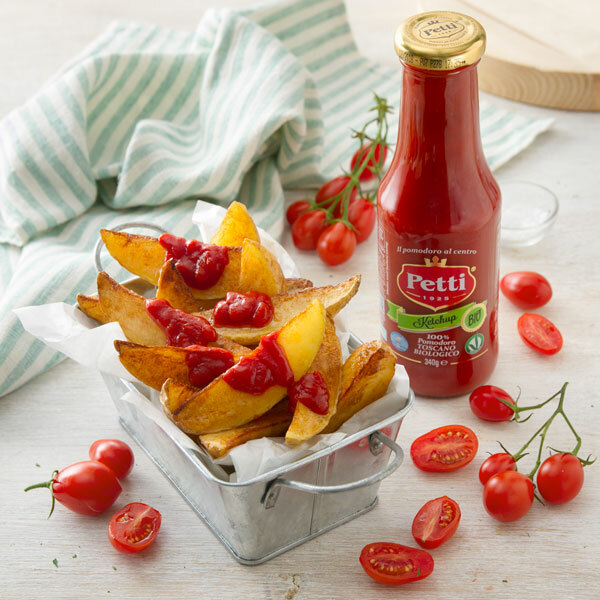 Drain the potatoes onto absorbent paper and finally serve hot with organic Ketchup Petti.